Thank you to Santosh and the team in nepal, the school buildis going great ! ICM supports you ! Our Newest Ambassadors have been feeding children in the slums of India for 15 years. Founded by Munesh Sinha and his family, they are currently caring for 3 schools who's rent increased 20 % per year. We are hoping to help them buy a piece of land and build a school and garden, Their address is D-416, railvihar, indirapuram, 201014 ghazlyabad Click the link and visit the site it's beautiful !!! International Children's Month is happy to be helping. 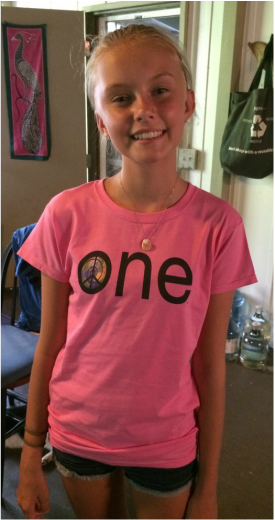 Partnering and supporting the message of ONE family our project shirts are here ! www.oneclothingunify.com and/or READ ON ..
Each ONE shirt supports you, the people who see you wearing it, the statement, the acknowledgement the building of this beautiful and empowering platform, workshops for children, video series, and advancement of schools. Thank you for your support and for being snazzy enough to wear this awesome T Shirt ! !